Complimentary 1 Nando's voucher when you spend above RM500 with Maybankard. 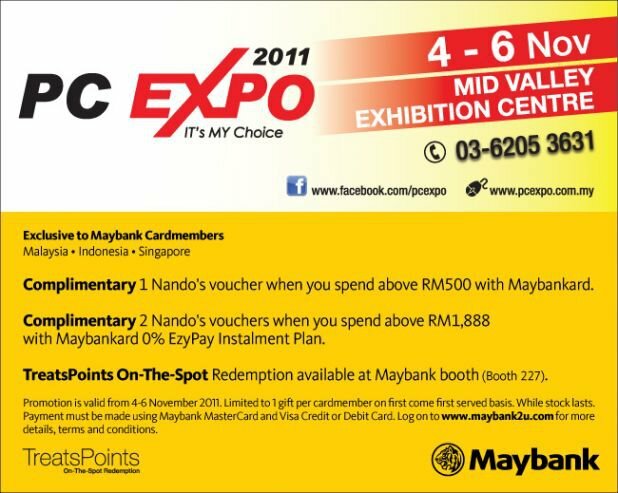 Complimentary 2 Nando's voucher when you spend above RM1,888 with Maybankard 0% EzyPay Instalment Plan. TreatsPoint On-The-Spot Redemption available at Maybank booth (Booth 227). Promotion is valid from 4-6 November 2011. Limited to 1 gift per cardmember on first come first served basis. While stock lasts. Payment must be made using Maybank MasterCard and Visa Credit or Debit Card. Log on to www.maybank2u.com for more details, terms and conditions.